Merry Christmas & Happy Holidays Nerds! I’m a novice when it comes to cooking and baking, but I always enjoy both cause it gives me a chance to be creative in another way. Cupcakes are by far one of the funnest baking projects for me, there’s endless ideas, and their so stinking adorable! Like any other craft lover I spend most of my phone’s battery power on Pinterest, and came across this cute gift idea from oh! 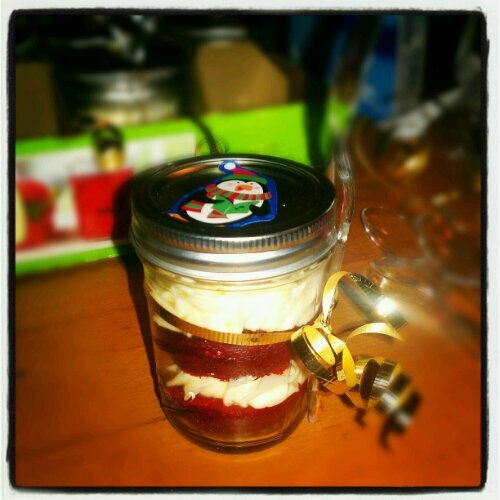 cupcakes for yummy cupcakes in a jar. I used a box cake cause my budget was a bit tight, but they still taste amazing especially with a boatload of very cream cheesy cream cheese frosting! I hope the ladies enjoy! If you’re schedule has been anything like mine lately then you know Christmas shopping can be very stressful. I love shopping but after a fifty hour work week and a busy home life, at the end of the day I have become fast friends with my bed hehe. When Cyber Monday came around I had the luxury of being able to get some Christmas shopping done while I work :). I tried to make a conscious effort to keep any shopping I do until Christmas is over for friends and family only, but I just couldn’t resist! Too Faced Cosmetics had an early Cyber Monday deal for a mystery grab bag for only $19 but with a value of $100! I was beyond ecstatic but a bit skeptic it might just be a bunch 7of samples, but for $19 it was a skepticism that quickly passed. I anxiously awaited for it to arrive, and yesterday it came and before I could get in the door I was already tearing the box open. Let me just say, the items that I received in this grab bag were beyond my expectations and I was so happy! I received five (that’s right five!) full sized products in my grab bag for only $19! Holy guacamole this baby lights up! Did you get your hands on one of these amazing grab bags? I can’t wait to see what others received! I’ve missed you guys! As silly as it may sound, I felt like a part of me was missing. Now that I’m back I’ve got so much awesome stuff coming your way :). More importantly, I am excited to announce I started a new job as a teacher. It’s a completely new scene for me but since I started I love the school I’m at, and the children are so amazing. I can officially say I love my job :). These past couple weeks have been very very stressful and surreal. My boyfriend lost one of his best friends this past week and its been very somber in our home. His friend was a great man, I was lucky enough to have known him the couple years since I was introduced to his childhood friends, so I can only imagine the pain and loss Tim is going through. So, for now I will be taking a brief hiatus to be there for my boyfriend as well as move on myself.